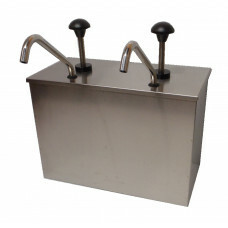 Our Centerstage Professional Condiment Station is constructed of heavy duty stainless steel for heavy traffic spots such as sandwich shops, concession stands, and convenience stores. Our commercial grade condiment station will provide years of service and features two stainless steel 1.25 oz pumps ( not plastic like most models ) and 2 stainless steel insert wells that will accept #10 cans, 1.5 gallon containers or 3-quart stainless steel jars. The pumps dispense a maximum of 1.25 oz per stroke of your favorite condiments.